We are now far from a reality where software is understood as being something that exists only inside a computer. Instead, our modern lives are only possible because of the ubiquitousness of software – it is everywhere, all the time, from our laundry machines to our cell phones, from our video games to our navigation systems. Nowadays, most of us cannot even drive around armed only with a paper map instead of a SatNav (Daily Mail, 21 January 2013). The ‘AI Takeover’ as fictionalised by Gibson, Ellison, and even consumer-media giants such as Marvel (Ultron) and the Terminator film series (Skynet) seem now closer to reality than fiction, and science giants such as Stephen Hawking and Elon Musk have even written in advice of creating precautionary measures to ensure this doesn’t happen. HAL from 2001: A Space Odyssey is a perfect (albeit fictional) example of what Kitchin and Dodge describe as software exhibiting “some of the characteristics of being alive” and it being able to ““process information, evaluate situations, make decisions, and, most significant, act without human oversight or authorization”. We are increasingly handing over our decision power to software, not out of laziness but simply because we don’t know now not to. But software, like us, has a body. Code occupies space in the form of hardware, and without these physical technologies the automated codes and processes we depend on on a daily basis – to receive our monthly salary or remind us of someone’s birthday – would simply not be there. Ingrid Burrington and Dan Williams explored this particularly well in their Networks of London piece. The duo created a map – now available for download but present in the exhibition in the form of a cork board with post-its and pinned-down handwritten papers – of spatial representations and physical objects that serve as live, warm bodies for the codes that allow London to function. The question the authors pose is pertinent – “how do you see the Internet?” – and they attempt to answer it by circling and marking on a map objects such as CCTV cameras, antennae and utility cabinets. Without these objects, ‘networking’ and ‘connectivity’ cannot exist. This is made ever more noticeable by Timo Arnall’s Internet Machine, where one can truly experience (ironically through an audiovisual projection of the real thing) the physicality of code by standing in the centre of a living, breathing data storage and processing centre. Without us fully realising it, our lives – from tweets to selfies, check-ins to bank accounts – are stored in those whirring, buzzing corridors and made available both to us and to our governments and big companies (such as Google or Facebook) via antennae, utility cabinets, wires and cables. We become code, through our purchases, phone calls, use of GoogleMaps and any questions we ask Siri. We become a commodity, something to be used, shared, sold to the highest bidder for marketing and indexing. Where is the line between code and space? Where is the line between public and private, now that our sensitive information is in large invisible databases and not a paper folder? If there even is such a line, would we still be able to live our lives as we do now if our private because truly private again, and all the antennae in the world just stopped working? The topic of ‘Digital Cities’ encompasses many things ubiquitous in our daily lives – traffic surveillance cameras, which bus to take and what time the post office closes via GoogleMaps, checking the weather on your iPhone every five minutes to decide on taking an umbrella. But the intricacy of connectivity and the constant sharing and availability of hundreds of other types of content, provided by us, the citizens, can make our Digital Cities not only more complete and complex but also more helpful – and not just in terms of timetables and rainy days. Take Umbrellium’s piece present at the Big Bang Data exhibition, for example. Essentially a live, interactive, annotated map drawing on the growing theme of the “Internet of Things”, the aptly named “Thingful” gathers and displays information collected and shared by devices all over the world. To anyone looking at “Thingful”, these readings provide an array of readily-available data including energy and radiation readings, localised and updated weather conditions, air quality devices “as well as seismographs, iBeacons, ships, aircraft and even animal trackers”. 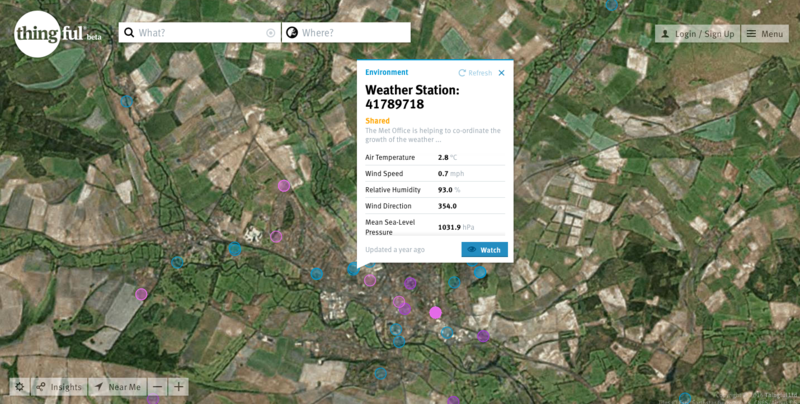 Thingful | Showing an active weather station in Salisbury. More accurate than the Apple weather app? Here we start to have an emerging theme central to the Digital City: the existence of an ‘interactive, networked databased’ (drawing loosely on Miller’s themes of the technical processes of digital media). In the digital city of today, it is the citizen that provides information (and possibly guidance) to others via interaction and subsequent contribution to these ‘databases’. These databases have “little no meaning on their own (…), but have the potential to be related to other bits of information or objects and thus together can obtain a layer of meaning” (Miller, 2001). 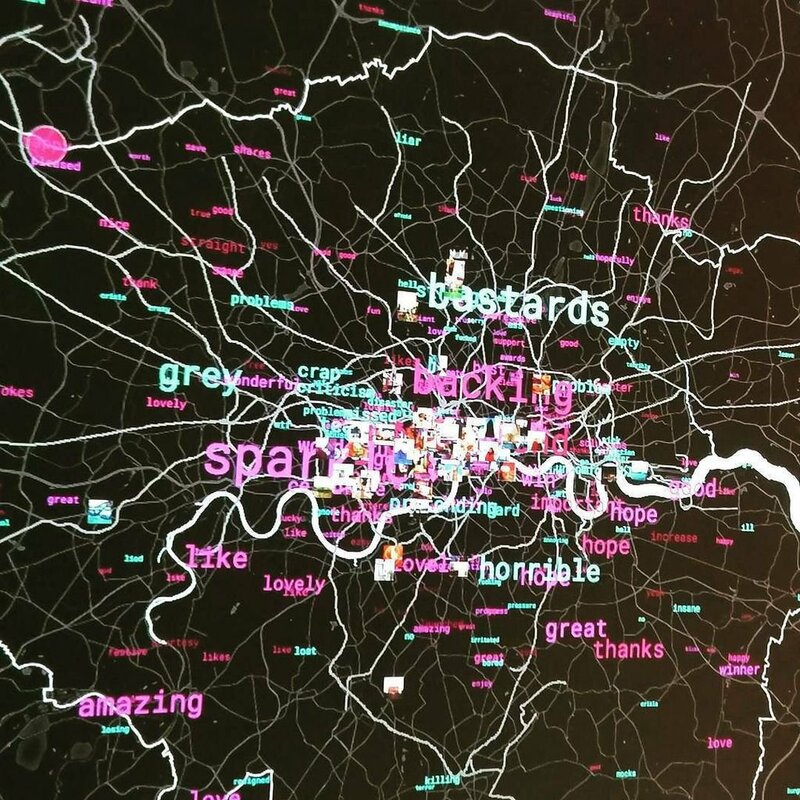 The most interesting example is Tekja’s “London Data Stream”, where ‘tweets’ and other information posted in real time by citizens to their own public social network accounts allows for a creation of a ‘happiness map’ of London – where and when are people the happiest, and why? Through Miller’s technical processes of digital media, several ‘interactive networked databases’ are created, allowing citizens to have a greater understanding of not only their city, but themselves, helping them make better decisions for the future. 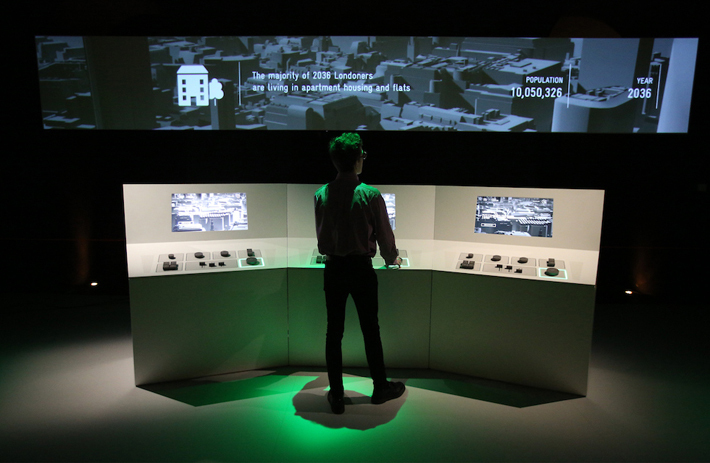 “London 2036” puts you to the test; will you do better than Boris Johnson? It is ultimately the information gathered via Umbrellium and Tekja’s projects that would guide the visitor to make the best possible decisions for the City of London in the “London 2036” city management simulator created by Future Cities Catapult. Armed with knowledge about our cities that goes beyond where to switch lines in the underground, we can ultimately make – or, in the case of the “London 2036” project, attempt to make – the right decisions for our happiness as individuals, as active citizens and as a society. Now that we know how people feel about the amount of green space in Lewisham and the air quality in Hackney, we can finally start to do something about it.